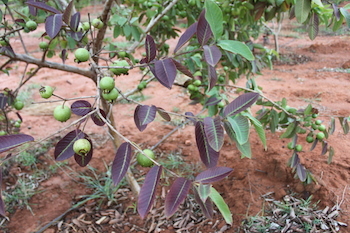 The taste of tree-ripened nutrient-dense fruit is one of the many joys in my life. 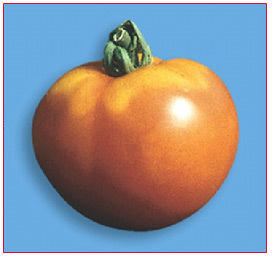 I love a flavorful apple at the peak of ripeness, the sweetness of a juicy custard-textured persimmon, a glass of vibrant orange juice. 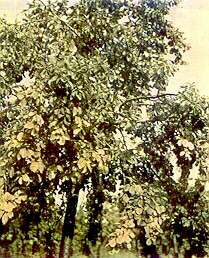 Picking ripe wild blackberries was a late summer ritual in western Oregon where I grew up. 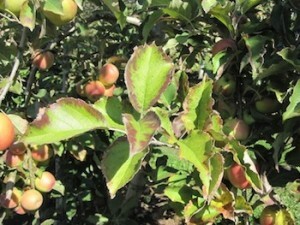 Now I have a new ritual; every year I plant fruit trees. Fruit trees and citrus are an excellent indicator of topsoil and subsoil deficiencies. 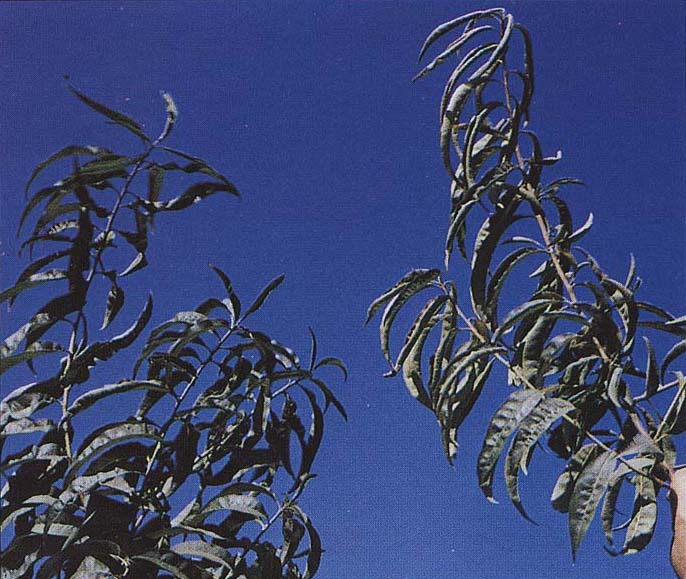 Since we are growing in sandy, low CEC soil here at Rancho Reinheimer, I have become a connoisseur of mineral deficiency descriptions and photos, searching for the “silver bullet” that will cause my trees to look like those in the nearby commercial orchards. 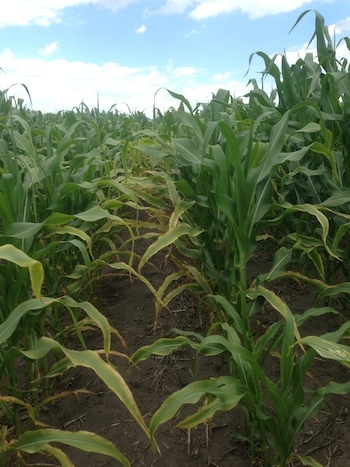 It is this futile search for the “silver bullet” that originally led me to the use of soil testing and mineral balancing, but that’s a different story. The long and the short of it is, deficiencies can and do show up in similar ways for different types of plants. 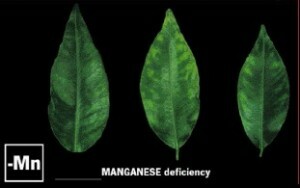 They are an interesting indicator of how minerals move or don’t move in the plant and of mineral interactions. 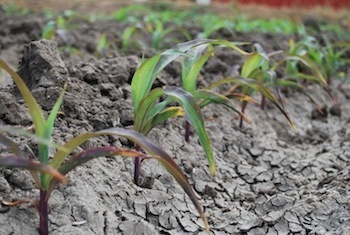 The pH of the soil can also affect availability of certain nutrients in the soil and can prevent their uptake in the plant. For example, high pH (>7.5) can block the uptake of iron. 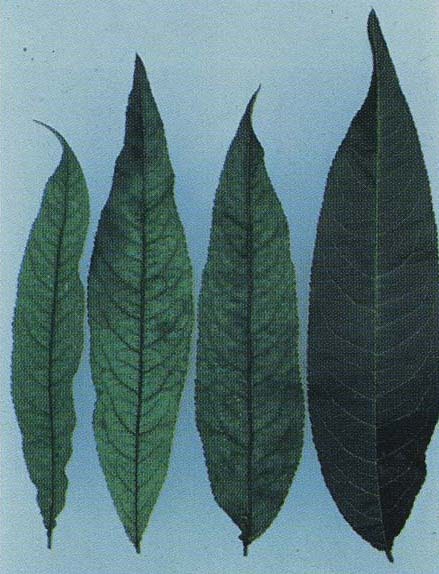 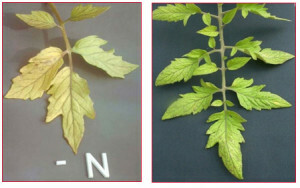 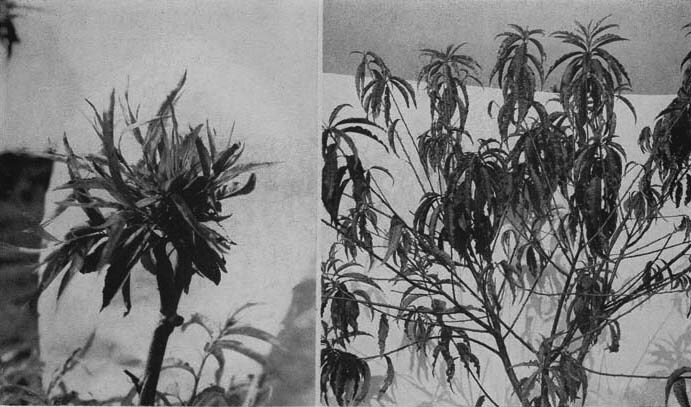 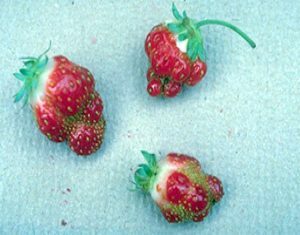 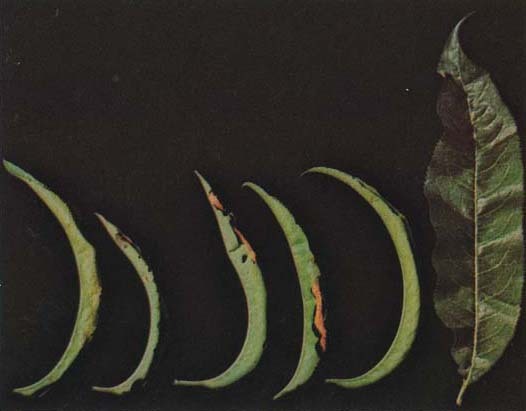 Many of the pictures of nutrient deficient plants shown below have been taken under laboratory conditions, where just one nutrient at a time was withheld. Insect damage or disease symptoms can also look like nutrient deficiencies! 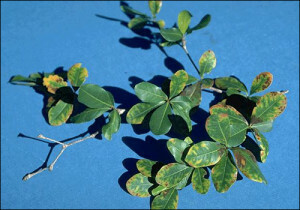 Or a plant may suffer from multiple deficiencies, adding to the confusion. Any diagnosis of a nutrient deficiency should only be made on the basis of a tissue test – a test where leaves or other plant parts are tested for nutrient content (it is best to test a control “healthy” sample at the same time). 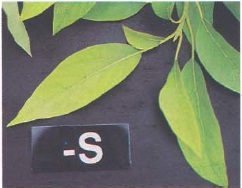 The instructions for doing a tissue test are on the test labs’ web site. 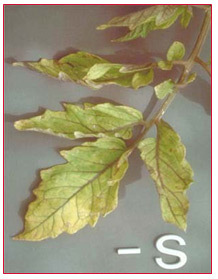 Table of contents (references at the bottom of the post). 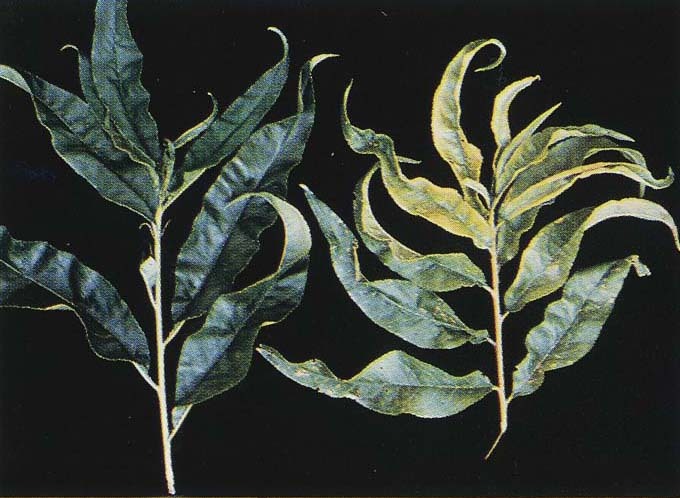 Nitrogen is one of the major nutrients needed by plants — it is used to make chlorophyll — and it is one of the most difficult to find organic sources for. 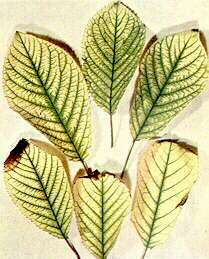 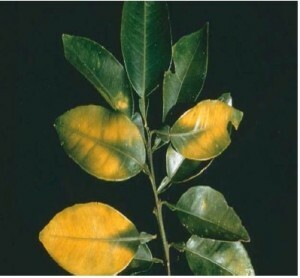 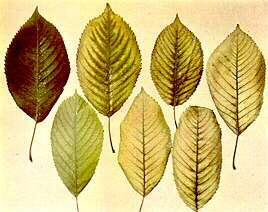 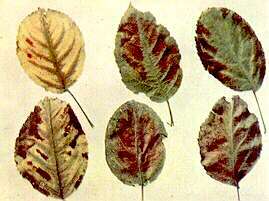 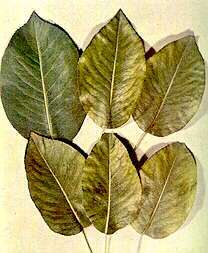 A deficiency can result in yellowing of older leaves first as nitrogen is translocated to new growth in the plant. 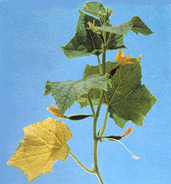 Stunting of growth can also occur. 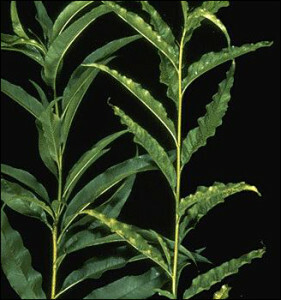 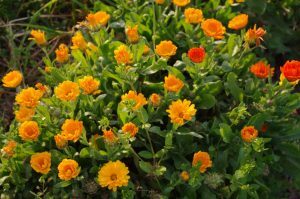 Different types of plant exhibit different symptoms — not all plant turn yellow. Nitrogen deficient lemon leaves with normal leaf on left. 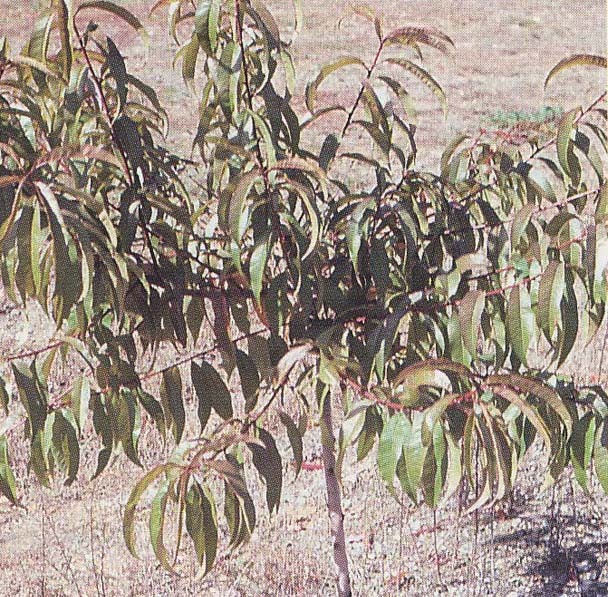 Nitrogen deficient peach tree. In this case the new growth comes in with reddish leaves. Nitrogen deficient cabbage showing reddened older leaves. 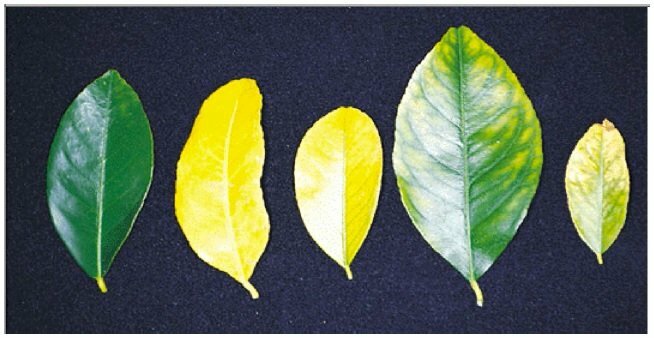 Sulfur deficiencies look a lot like nitrogen deficiencies however sulfur deficiency affects new growth first because sulfur does not translocate easily in the plant. 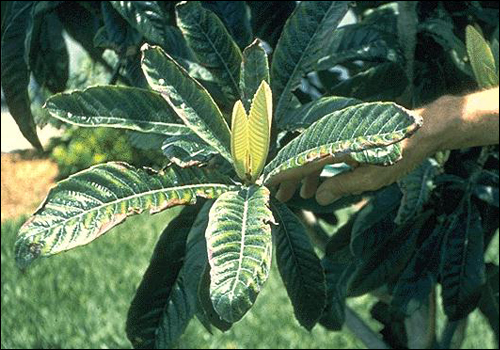 Phosphorus deficiency can occur in cool weather. 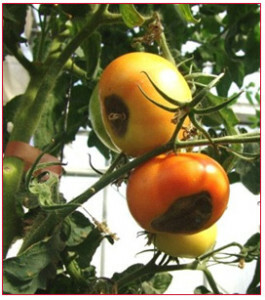 Our young tomato plants seem to be especially susceptible in early spring. 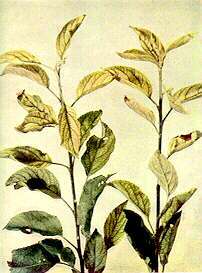 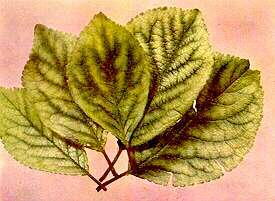 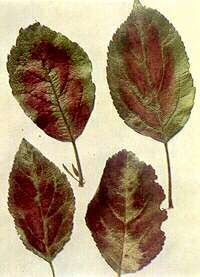 It is characterized by a red or purple cast on new leaves and poor, stunted growth. 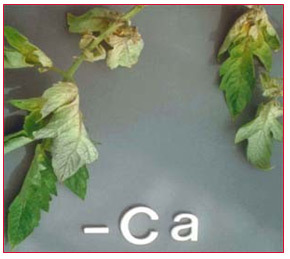 Calcium aids in cell wall strength in the plant. 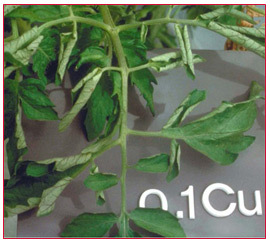 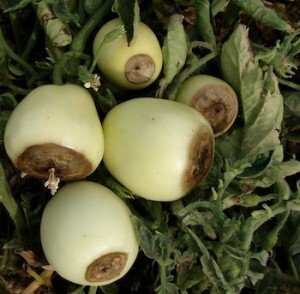 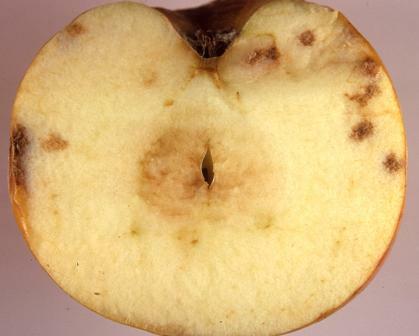 When deficient it can contribute to blossom end rot in tomatoes and corky spots in apples. 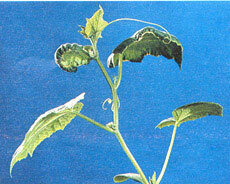 Calcium deficient cucumber leaf showing curling of leaf edge. Normal peach leaf on left. Calcium deficient leaves show necrotic (dead) spots in center before leaves dropped. 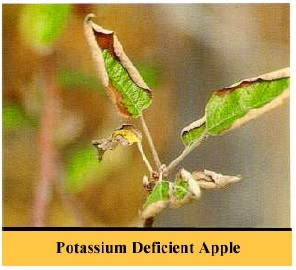 Magnesium can be deficient in certain soils. As with all deficiencies, it is best to have the results of a soil test and tissue test in hand before treating the symptom. Magnesium is especially hard to get out of the soil once it’s in. 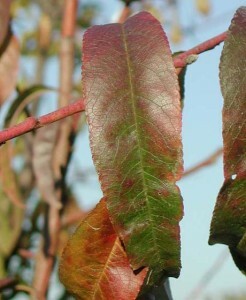 Magnesium deficient cox pippen apple leaves showing purple tint and necrotic (dead) areas between the veins. 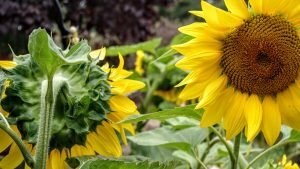 Potassium deficiency is not usually a problem for organic growers who apply composted manure, since manure is a good source of available potassium. 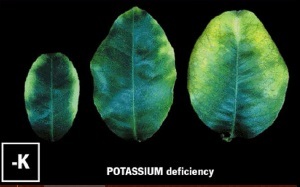 Potassium deficiency shows up in the edges of the leaves first. 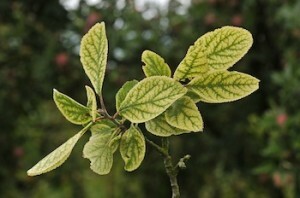 Manganese deficiency produces a leaf yellowing similar to zinc deficiency where the veins of the leaves remain green while the part between the veins turns yellow. 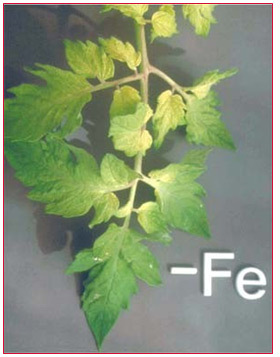 Iron deficiency tends to occur in high pH soil, where the pH is higher than 7.0 or in soils that are severely imbalanced. 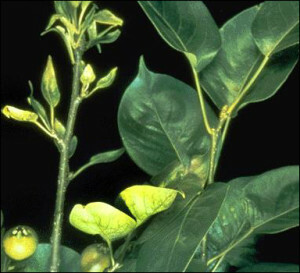 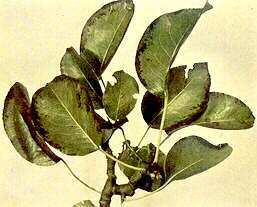 Its symptoms appear as a yellowing of the leaves in a manner similar to zinc or manganese deficiency, usually with green veins remaining. 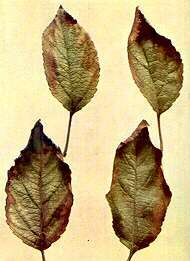 In the mineral world they say that calcium is the trucker (in that it moves all the other minerals) but boron is the truck driver. 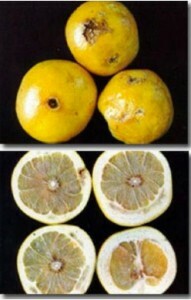 This is apparent in the pictures of boron deficient fruits and trees. 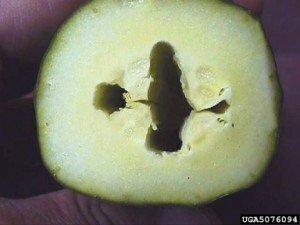 Somewhere along the line the truck has gone off the road, resulting in strange shapes, hollow or hard cores and variable leaves. 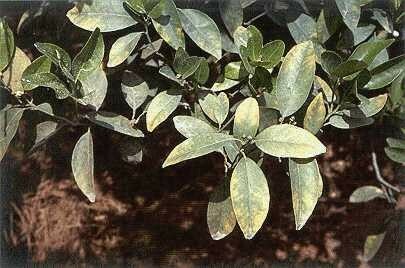 Boron is mobile in the soil and subject to leaching. 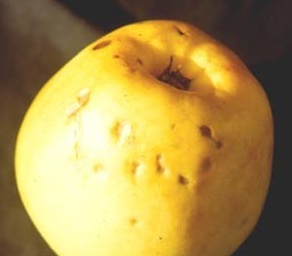 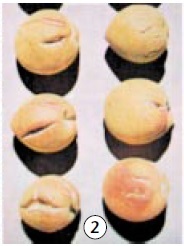 Boron deficient apricot fruit showing typical striations and cracking. 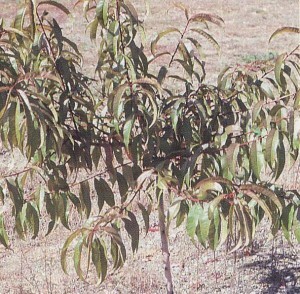 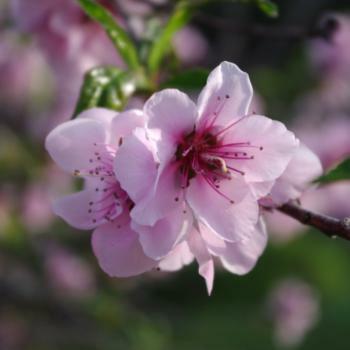 Boron deficient peach tree. 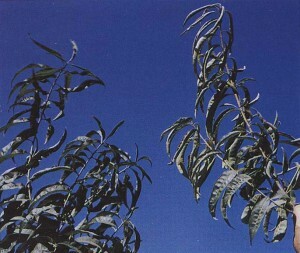 A normal tree is shown on the right. 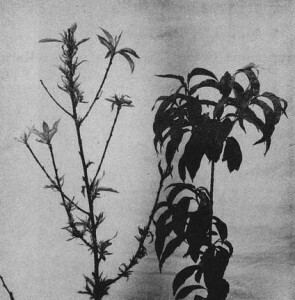 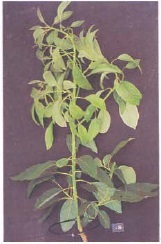 Notice the rosette cluster of leaves at the tip of the branch, and the dieback of leaves on the branch. 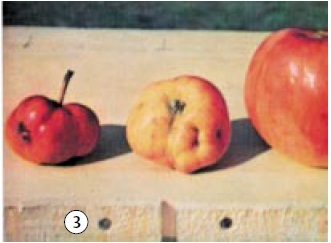 Boron deficient apples (normal apple on right) showing deformed and stunted growth pattern. 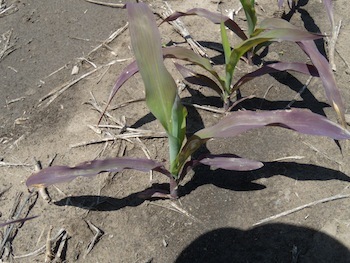 Boron deficient cauliflower showing typical hollow stem. 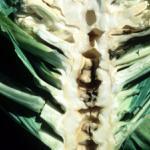 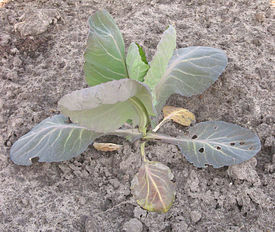 Boron deficiency can cause hollow stems in all brassicas; cabbage, brocolli, cauliflower. 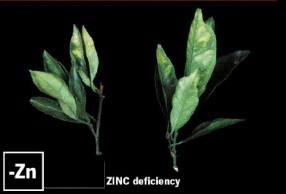 Zinc is another element that becomes less available at higher pH’s. It can be the limiting factor in tree crops in the drier and more alkaline western US. 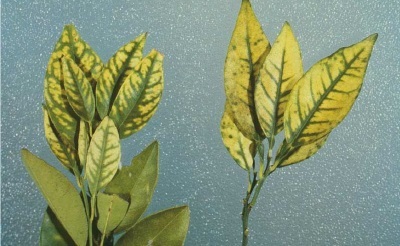 Zinc deficiency causes a symptom called “little leaf” where new leafs are abnormally small and causes a yellowing of the leaf between the ribs, similar to manganese deficiency but with less smooth edges. 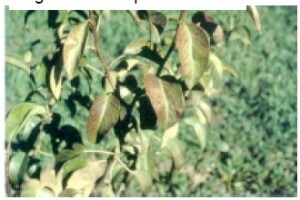 Zinc deficient peach branch showing narrow leaves in a rosette similar to boron deficiency. 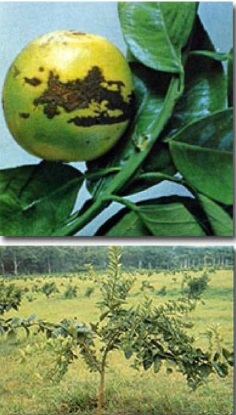 Copper compounds are often used in the orchard in organically approved sprays (and in conventional sprays) that are used to control fungal disease. 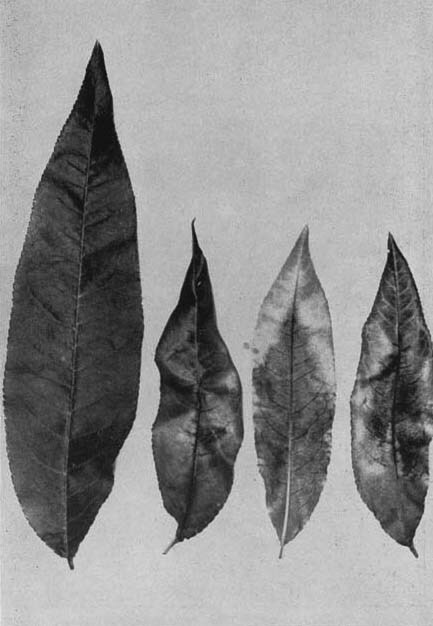 It is immobile in the soil, so if copper sprays have been used in the past, it is worth doing a soil test to determine the amount of copper present. 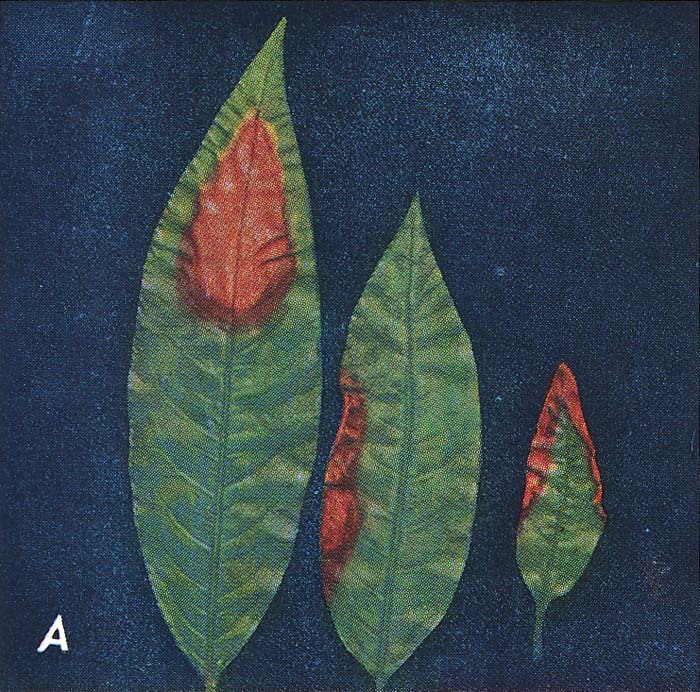 Because of its immobility, copper tends to build up and can reach toxic or at least unbalanced levels. 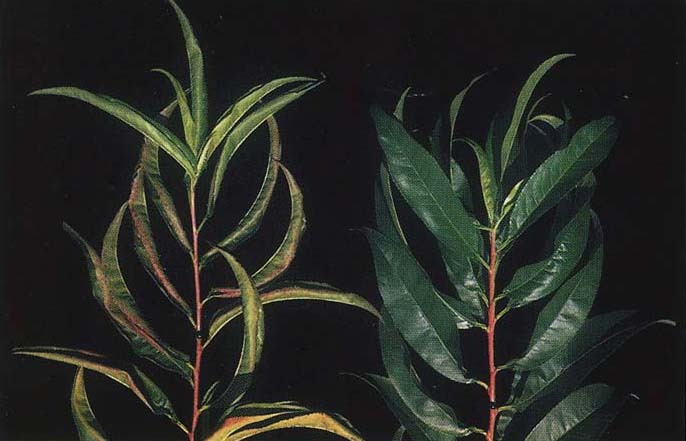 However, some soils are deficient in copper. 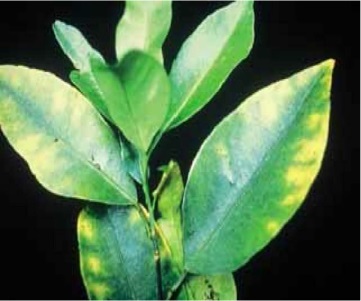 Before doing a soil application it is worth considering whether copper would not be better applied as a fungal disease preventative spray. 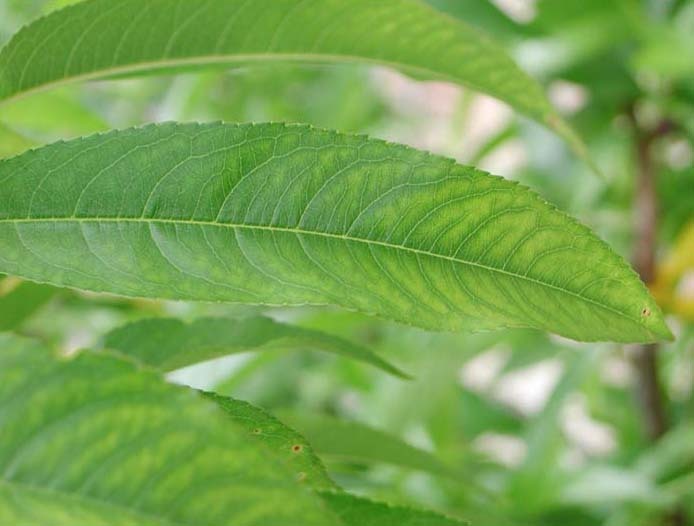 Copper deficient peach leaves. 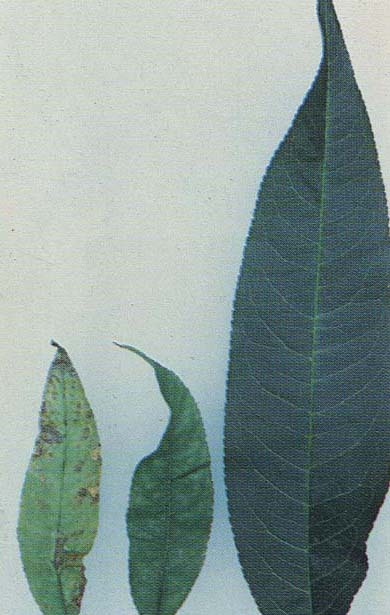 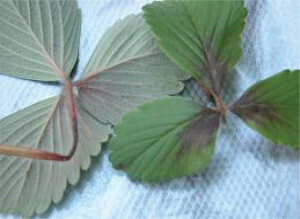 Normal leaf on right.